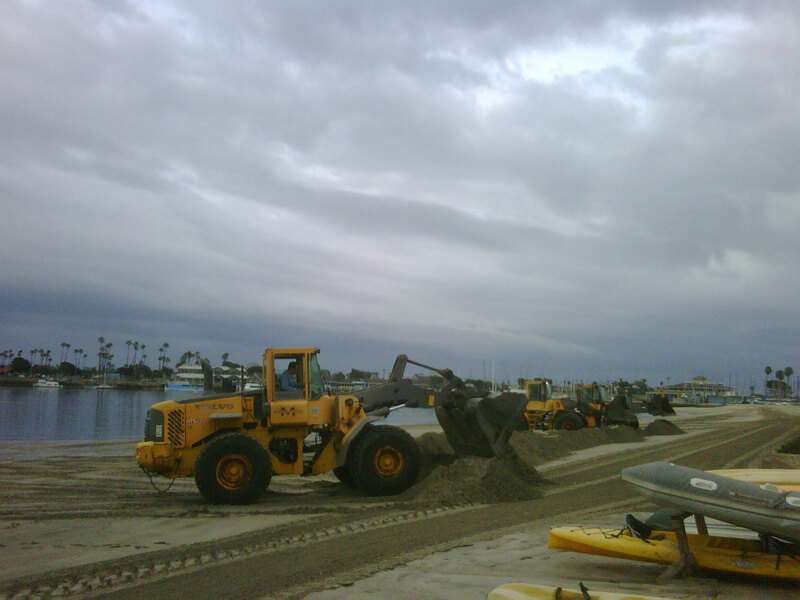 LONG BEACH — In response to a rash of rising high tides, the city of Long Beach’s Department of Parks, Recreation & Marine recently installed small berms along inner bay beaches to preserve the sand and safeguard surrounding homes in the area. The project ran from June 9 to Aug. 19 and included three separate phases. The first phase took place between June 9 and June 19 and was in response to tides reported at 6.5 to 6.7 feet. An eight-day berm initiative in mid-July saw tides rise between 6.4 and 7.0 feet. The final phase ran from Aug. 4 to Aug. 13. Easterby considered all three phases a success, noting that construction aided in minimizing the immediate loss of sand. Implementing front end loaders, city workers constructed undersized berms staked 2 to 3 feet in height and 3 to 5 feet in width. The heavy machinery pushed sand up from the toe of the beach at low tide to form a small sand wall along the outskirts of the shoreline. Easterby said that construction was a relatively quick process, noting that three workers recently completed a berm between 72nd and 60th streets in about 50 minutes. Easterby said the summer project’s construction came at the request of the community, adding that a berm is typically present for most of the year on the east beach, near the outside of the peninsula, between 72nd and 54th streets. The berms are built through the city’s general maintenance budget, but Easterby said the project is essentially the utilization of man hours. But with residential dwellings standing just 50 to 100 feet behind the berms, flooding has become a real threat. On July 6, a high tide breached the sand berm at Ocean Boulevard and 55th Place, but no damage was reported. Easterby said workers quickly responded to the breach and were able to patch it. While residents dodged a bullet, the peninsula hasn’t always been as fortunate. In early March, 20 homes along the Long Beach peninsula were damaged when high tides and heavy surf eroded a protective berm, causing flooding between 66th and 72nd streets. The high tide was reported at 5.52 feet. Easterby expects berm construction to pick back up at the end of the year.